power, reliability and quality define the np12-6, an optimal battery by yuasa. only the best materials are used in the np12-6. plus yuasa's specs have been equaled or surpassed in its construction. thank you for making batterytex your provider of replacement batteries at everyday low prices. 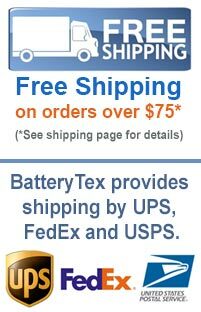 great replacement batteries, great prices, every day from batterytex.com. our battery experts are here to give you answers to any questions you may have or to provide you with information on bulk discounts: 1-888-825-6661. we have a wide selection of ups backup and sealed lead acid batteries batteries available. see them here! browse other terrific products by manufacturer: yuasa batteries are judged on how strong they are, how long they last and how well they're built. our batteries meet all of these qualifications and with amazing prices as well! if you want to find the warranty information and timing on a particular battery please contact us.